…We know that from the reaction of a visiting friend when we took a short cut through the fish market, one time. She’s vegetarian and couldn’t even bring herself to look at the fish stalls – but, as friends, we’re complete opposites when it comes to seafood because we can just never resist slowing down to admire and covet all that’s for sale on the stalls. And we take lots of photos, too, of course. Some days, we go to Fethiye fish market and there’s the usual fish stall scenes – the staples that fill the stands on a daily basis. Other days, there are stalls packed with seasonal treats such as hamsi and barbun (Mediterranean red snapper) or an occasional rare catch that holds pride of place. Yeah, they state the obvious – but what’s a market without the traders calling out to you, eh? We can’t not be excited by markets of any kind…and the beauty of Fethiye Fish Market and surrounding shops and stalls is that we don’t have to wait for a particular day of the week like we do for the fabulous Tuesday market. 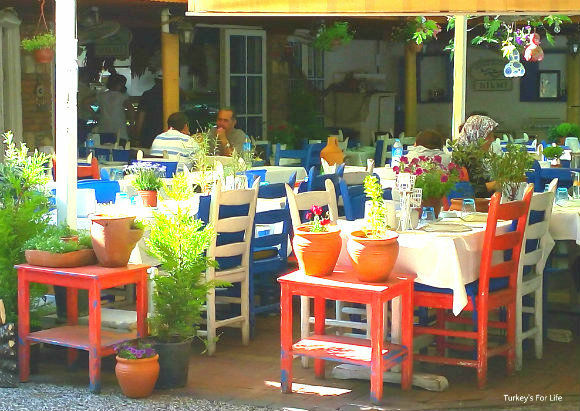 This fantastic little eating and shopping corner of Fethiye is there for us on a daily basis – and we make full use of it! When we first came to Fethiye, the fish market was just that – a few stalls. Then, a good few years ago now, the mayor of Fethiye had the idea to create an attractive fish market, surrounded by small restaurants which would offer meze and drinks and cook your fish for you – and provide salad and bread for a small fee. Simple idea, but genius! We don’t eat at the Fethiye fish market restaurants all the time but it’s become a bit of a tradition that we go with our friends who come out to visit. Wigan, where we lived in the UK, sadly lost its fish market many moons ago so it’s a rare treat for our friends to see the market in action. They love it! And whenever we go to any of the Fethiye fish market restaurants – everyone has their favourite ‘go to’ places to eat – it’s the same story every time. We order far too many meze dishes from the fridges and we buy far too many king prawns and end up absolutely full to the brim. What starts of as full appreciation of every morsel that passes our lips, later becomes please-take-this-food-away-from-me. But, this only happens once a year or so, so it’s not too much over-indulgence is it? Whose idea was it to order so many prawns? Obviously, the meze dishes and drinks are extra so you can make your fish market experience as cheap (or as expensive) as you like. The price of prawns, for example, varies greatly depending on their size and time of year and obviously, we jump on them when we see a good price. But then there is also sea bass and sea bream. This type of fish was a huge treat when we were living in England, but they are staple fish in this area. If you are in Turkey on a budget, you can pick a decent sized bass or bream for just a few lira. These cheaper ones tend to be farmed, ask the fish monger if you’re not sure, but the prices should give you a clue, while the more meaty fish caught out at sea are obviously more expensive, but still very reasonable compared to the UK. Over the years, the Fethiye fish market restaurants around the stalls have really upped their game – and these days, there is also a good choice of seafood meze for you to choose from, similar to those served at restaurants such as Girida Balık and the meze at Denizatı. You’ll get all the usual suspects, too, of course; servings of Antep Ezmesi, barbunya and yoghurt dishes…and so on and so on. Like we said, you can make this as cheap or as expensive as you like. Wash all of this down in traditional style with a rakı or two – or stick to your tipple of choice – and, if you’re there on a busy night, you’ll also get the added treat of wandering musicians filling the market air with the sounds of fasıl music as they tour from table to table (don’t forget to tip them if you enjoy them playing by your table). We’re not recommending specific restaurants inside the fish market. Everyone you speak to has their own personal favourite so you can take advice from others or just go for a walk around and choose your own. We will, however, give one little tip if you’ve never been before and you want to try it: choose your restaurant first. There will be waiters stood outside each place trying to talk you into their restaurant. Choose where you want to go (the cooking, salad and bread price is the same in each restaurant), sort your table and then go to choose your fish. Pay for it and tell the fishmonger which restaurant you are sitting at. He will clean your fish and take it to the restaurant for you. In the meantime, you can choose meze dishes from the fridges in the restaurant and order drinks. Some of the bigger restaurants are starting to put fish on their menus, meaning you can just go and sit down, order from the menu or fridges and eat, skipping the market altogether. Personally, we prefer to choose our own from the market. It’s all part of the Fethiye fish market experience and there are loads of other specialist seafood restaurants around Fethiye where we can just sit down to eat. If you are desperate to visit the fish market in Fethiye and you are with people who just don’t do seafood, it’s perfectly okay for them to buy meat from the butchers and pass it on to your chosen restaurant to cook. Some of the bigger restaurants also have a separate menu where you can order other non-seafood meals, including vegetarian dishes. If you are ordering prawns and don’t want them to be cooked in their shell, ask the fishmonger to clean them for you as the restaurants often don’t have time. A lot of people say Fethiye fish market is expensive. Yes, you can soon rack up the lira if you are eating lots of meze (especially seafood meze), various courses – and drinking wine or rakı – but it is no more expensive than other seafood restaurants around Fethiye. Ask the drinks prices if you’re on a budget – alcohol prices in Turkey are not bargain basement and it’s these that often bump up the bill. You can make Fethiye fish market even cheaper than restaurants if you are just there for a simple fish dish with salad and bread. Don’t forget, you are buying your fish at market price, not restaurant price and the price for cooking your dish is around £2.00 per head, per course. Also, most of the prices on the Fethiye fish market stalls are price-per-kilo. So, at first glance, it can seem pricey. A sea bream or bass for one person will often weigh less than 500g so don’t forget to half the price. All of a sudden, the price might not seem so daunting. On this day in the photo above, for example, one sea bream (çupra) would have cost you around 12 TL (about £3.00). Add on your £2.00 for salad and bread and you’ve got yourself a fresh sea bream meal for 20 TL (about £5.00). 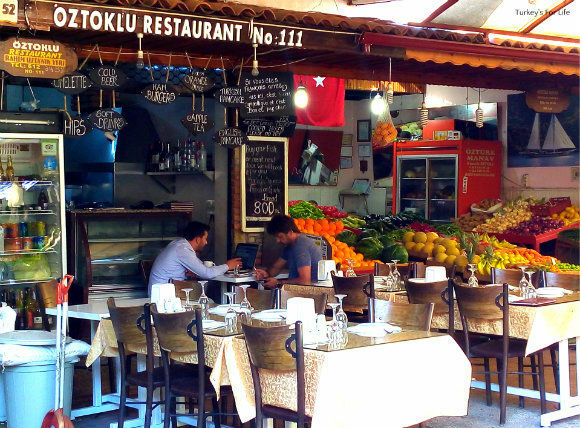 The fish market is not just somewhere you go for an alternative eating experience in Fethiye. It’s also a fantastic shopping experience where we do quite a bit of our food shopping. If you read this blog a lot, you’ll know we buy our fruit and vegetables from the Fethiye and Çalış markets. Fish is bought from the fish market and there are also butchers shops and dairy stalls, too. Fethiye fish market is a one-stop shop for all of our favourite goodies. If we’re in town, we usually go via these shops and stalls to pick up our shopping on the way to the dolmuş stop. This is where we can come to buy our loose cheese, süzme yoghurt, olives, chicken and homemade sucuk. At our regular fish mongers, sometimes, we’ll go to him with something in mind – often, hamsi in winter so we can make our hamsi in bread. If we’re doing a summer barbecue with friends, a sword fish steak can make up a good few şiş kebabs. Cut the steak into cubes, alternate the pieces with peppers and onion and bingo – lots of fabulously tasty luxury kebabs at little cost. Sometimes we’ll just go and choose whatever looks particularly tempting on that day – and other days, we’ll have a recipe in mind. Actually, more often than not, when we go to Fethiye Fish Market it is to pick up some fish to cook up at home. When we lived in England we developed an obsession for buying cookery books. Of course, there are millions of recipes online these days but there is just something about thumbing through the pages of a book, isn’t there? One of our favourite seafood chefs is Rick Stein…but, as we were young, poor students in England, all the enticing recipes were usually an unaffordable dream for us. Sea bass? Sea bream? Out of our league! We could stretch to a bit of frozen cod but that was about the limit – and Rick Stein’s recipes always seemed to tempt us with those unaffordable, untouchable luxuries of the ocean. And whatever fish we’re buying from our fish monger, whilst it’s being cleaned (hamsi can take a good few minutes), we can go over to fruit and vegetable stalls and buy our lemon, rocket leaves and whatever else jumps out at us at the time. Yes, we always leave Fethiye fish market with a heavy backpack and shopping bags full to the brim. Our regular fruit and vegetable stall is actually inside the fish market area but there is also a separate, adjoining fruit and vegetable market which not only hosts various grocery stalls but also has one of the fish market restaurants tucked into the corner and various spice stalls. We’re often to be found here, topping up our spice cupboard. What a lovely way to do your shopping, eh? Well, it’s a choice, isn’t it? We can go to the supermarket and walk up and down the aisles of pre-packed foods and spices, throwing them into our trolley – quick and convenient – or we can wander from stall to stall, chat with familiar stall holders, enjoy the aromas of the spices and loose herbal teas and marvel at the patience of the spice guys as we order 50 grams of just about every dried herb and spice on the shelf; a little process in itself. They ask us what we’re making, we tell them and then they suggest other herbs and spices, too. A full cupboard of essential ingredients for all the Turkish cooking we like to do as well as our more international recipes, too. The spice stalls around the fish market have everything we need. And that’s the (sometimes) noisy, colourful, aromatic world of the Fethiye fish market area for you. An enclosed, outdoor eating and shopping experience of restaurants, fish stalls, fruit and vegetable stalls, butchers, dairy stores and spice stands. There are loads of perfect excuses not to rely on supermarkets in Fethiye – and Fethiye fish market is one of them. The fish market in Fethiye, along with the other surrounding shops and stalls, is open on a daily basis, year round. The fish market is open til late into the evening, especially in summer and winter weekend nights. In winter, restaurants are warmed with heaters and most are enclosed. Some people struggle to find the market. If you need a Fethiye fish market map, we have highlighted the area here on our Map of Fethiye to make it easier for you to stumble across. what a great tradition. Reminds me a bit of Thailand, where you choose your meal around the fish. There you have banana shakes instead. We sometimes buy the farmed fish for that reason Sarah. The Med is horrendously over-fished and I do think Turkey is going to have to look into farming more, just to help stocks replenish. I always think how you are lucky to live in Fethiye. You always have the chance of buying the frshest fish there. I love shopping at the fish market here in Eskisehir, but I’m sure the one in Fethiye is better. I’m a fan of sucuk, but no sucuk can tempt me if I see fresh fish in front of me! I’ve never tried fish with beans, sounds so intriguing! I wish I had been invited to your dinner. Very lucky. Is the seafood shopping in Eskisehir not great, Zerrin? I know you’re a little inland but I thought you might get the Marmara/Bosphorus/Black Sea fish? Fish with beans – it was lovely! We can’t resist the markets, Christy. Frustrating if we’re visiting somewhere and staying in a hotel / hostel – we can’t buy lots of goodies to cook. The fish look delicious! I love fish but there aren’t markets around here for it (we’re nowhere near any fishing) and my wife doesn’t like it. However, this looks delicious! It was delicious and we had some left over for lunch the day after. I’d miss seafood if it wasn’t available. I’ve never had fish and beans cooked like that, but it looks awesome! Oh I knew there was another good reason I like you… 🙂 I’m a big fan of Rick Stein! I have 4 of his books and meeting him in Sydney a few years ago is an occasion I’ll never forget. We love Rick Stein, Corinne. Went to his restaurant in Padstow a few years ago. Best meal we’ve ever had. The markets are my favourite part of any city. I wasn’t aware of Rock Stein until Top Chef Masters, he’s certainly a character. We always hunt the markets out, too Ayngelina. Rick Stein has been a British favourite for many a year. Always love the markets. That fish looks delicious too! Markets are great aren’t they, Nancie?! Especially food markets. The fish here is gorgeous. Is the fish market open all year? Also what time do you need to be about to buy fish from the fishing boats? Yes, Fethiye Fish Market is open all year round. If you want to buy fish from the fishing boats, the boats are getting back into the harbour around 9am and a lot of the fishermen will put their fish on the harbour for you to see. My attitude to fish are at best ambiguous, but I love buying the at the market. Yes, there’s always fish left Julie, even later on. Fethiye fish market is open every day and night, even in winter. You can probably order food until around 10-10:30 pm ish. It’s not an early thing. Similar to most restaurants in Fethiye. Oztoklu is our favourite restaurant family run and just fantastic people and the fish they cook is amazing. Thanks for article can’t wait 2 weeks to go till I am back. We passed a seafood shop in Ankara yesterday and the fish looked fresh, so I’m really looking forward to trying some sea-bass and bream recipes. As you describe, both are expensive in England, so we really must enjoy them whilst here. I was wondering, back in England there is a long-standing suggestion of not buying fresh fish on Monday, as fishermen traditionally don’t work on Sundays. What about here? Do they work 7-days, or are some days offerings likely to be fresher than others? Perhaps I’m over-thinking it as sea-bass is so expensive in England you need to shop wisely. p.s. If distance from the coast has additional impact, we’re Ankara-based. Thanks a lot for your comment, Jon Ash. 🙂 Ha ha, I remember my nana always refusing to buy fresh fish on Mondays. The fish market in Fethiye is open daily and the local fishermen are out on the water daily. Some don’t even bother going to market – they sell their fish from the boat in the harbour. Some of the local seafood restaurants also catch a lot of their own fish, too. Fethiye’s fish market also sells fish that has been frozen/refrigerated and transported from Black Sea areas and even from Norway (salmon), so it’s not all daily catch. Great, most helpful. I’m really looking forward to trying some of the local sea-bass, it does look good.